I moved most of the art that was in my dining room to my bedroom. I wanted art in my bedroom that would allow me to dream and a lot of the pieces that were in the dining room were of trips that I took (often with friends). Once most of those pieces came down I realized I wanted something different. I love making a mean gallery wall, but I wanted something a bit bigger and dramatic to balance out the fabulous piece by Doug Birkenheuer that hangs over the fireplace on the opposite wall. It's funny because the mantel has already been completely restyled since this photo! I found some incredible abstract e-sumi paintings at an antique store in Bucktown and I really wanted them, but they are currently out of my price range. I found a beautiful large abstract painting by an artist I follow. Her work is worth the price, but I need to save up some money to make it possible. I firmly believe that art is an important investment. It is one I have been making in smaller pieces over the years but my need for something big is challenging my bank account! So for today, I am looking at prints. One option is for one large piece that takes up a huge chunk of that wall. Except, that will probably cost more money and it will be expensive to frame. The option I'm leaning towards is a triptych. Three pieces either of one art work broken up, or three pieces that are different but speak to each other. Here is a very poor rendering of what I am thinking of for that wall. I started looking on Minted but they didn't have any triptychs easily searchable. Next I turned to Society6 and they had some great triptychs but nothing that made my heart go pitter pat and fit the look I was going for. I like that these sites provide artists with a platform to sell their work and I have found fabulous pieces on there before. I learned of a site called Desenio and they totally had pieces that had the vibe I was looking for. Like these three mountains. I loved the color scheme and the way the looked together. I also loved the first one because it reminded me of the mountains in Lesotho, but I'm not really a mountain girl. The next three were so cool, but ultimately they just didn't work together. There wasn't really a third option to go with the black and white photos. I kept finding two that I wanted but couldn't find a third and so I switched gears and headed to Etsy. 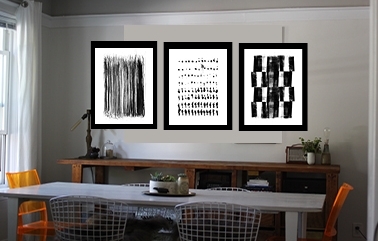 I searched for black and white triptych, but didn't find quite what I wanted so I narrowed the search even more to black and white abstract triptych. And then I found what I wanted. It's got lots of movement, it's black and white, it's an already matched triptych and it comes in the size I want. Plus! It is made by an artist in Minnesota. While reading this blog post it may sound like I found what I wanted within a day, but I've been thinking about this wall for a couple of months. I've been finding myself drawn to abstract art (which is very challenging to execute) and wanted neutral colors because the other walls in that space have art with color. It did take a few hours to search through some of the sites but once I saw it I knew that was what I wanted. Sometimes budget constraints can be a good thing! They make you really narrow down your focus and think through what you really want. There are so many great artists offering prints that it is a shame to let yourself not enjoy art because you can't afford the real thing.